Did Iran release Abu Ghaith to show the USA its good faith in February nuclear negotiations? Is Tehran serious about nuclear negotiations with the P5+1? In the month before the recent round of negotiations held in Almaty, Kazakhstan on February 26 and 27, Iran released into neighboring Turkey Osama Bin Laden’s brother-in-law, Mr. Suleiman Abu Ghaith. The Islamic Republic of Iran had been detaining him since his capture some 11 years ago, when he entered Iran along with other top Al Qaeda leaders to escape the U.S. invasion of Afghanistan. His precise date of release into Turkey is not clear, however, according to the English-language Turkish paper, Hürriyet, he was arrested by Turkish authorities in an Ankara “luxury hotel” on a “tip from the CIA.” Turkey then held him for “33 days” before deporting him to Jordan on March 1, and he was arrested by the U.S. on March 7.He has since been arraigned in a NYC federal courtroom on terrorism charges–including related to 9/11 as he had stood beside Bin Laden in the post-9/11 video where Al Qaeda took credit for the attack. ASIDE: Hürriyet Daily News is the third most accessed online paper in Europe; it’s printed daily in six Turkish cities and Frankfurt, Germany. Relevant articles include: His capture in Turkey, the U.S. request for Turkey to extradite him to the USA, his capture by US agents after deportation to Jordan as he was being sent on to Kuwait. Meaning of the release by Iran? So, the facts are one thing, their interpretation is of course speculative. Nonetheless, why would Iran release this fellow after eleven years at precisely this time, shortly before the renewed nuclear negotiations in February? The fact that the CIA knew of his release and whereabouts in Turkey is consistent with Iran intending for the U.S. to capture him; although this in itself proves nothing. However, the past history of an Iranian offer to turn over Abu Ghaith and other Al Qaeda prisoners into U.S. custody might shed some light on Iran’s current intentions. This important history appears to have been forgotten in present press accounts. 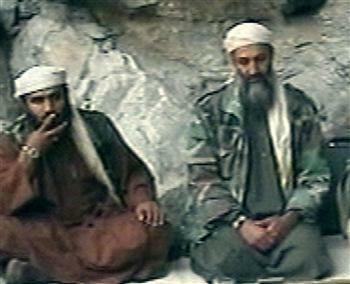 Iran had offered to hand over its Al Qaeda prisoners in 2003, as part of a “Grand Bargain” to normalize relations with the USA. In fact, Bush and Colin Powell were said to have initially agreed with the proposal, but later Bush’s neo-con advisers persuaded him to reject it. Trading members of Al Qaida it had detained fleeing from Afghanistan in exchange for members of The People’s Mujahedin of Iran (aka, The Mojahedin-e-Khalq, or MEK), which Tehran considered terrorists for a series of deadly attacks it had carried out against Iranian leaders. The MEK had sided with Saddam in the Iran-Iraq war of 1980-88 and had been detained by U.S. forces during the U.S. invasion of Iraq and were then being kept at a facility in Iraq. 2003 Grand Bargain: What did Iran want in return? Ending oil, nuclear and other sanctions (i.e. also, apparently recognizing Iranian right to develop nuclear power, in some form). These seem to have been the main provisions. When the Bush Administration turned down this Grand Bargain, it made clear it would not receive any further similar communications, even rebuking the third-country European diplomat who conveyed the offer. One can argue that this rejection was either justified or a great blunder. However, my point here is that this history should not be forgotten in interpreting today’s events. It should be remembered that it was precisely after this proposal was rejected that Iran began a propaganda campaign to its citizens that it had a right to invigorate its nuclear program. It then escalated its nuclear program into a serious attempt to develop an independent capacity to purify U235 from natural uranium ore … and it kept ambiguous the program’s possible military significance by frustrating IAEA inspectors. Clearly, its nuclear program became qualitatively different than before. I wrote and spoke extensively on precisely this linkage at the time. I argued in articles and in talks at numerous academic conferences and public talks that the reinvigorated nuclear program should be seen as a “gambit” by the Iranian side. In fact, Iranian academic colleagues in the USA, speaking together with me on public panels, added significant evidence from inside Iran as to the regime’s escalation of if formerly tepid nuclear program precisely after the rejection of this reported attempt at a Grand Bargain. After the Iranian leadership–in whatever fashion–had offered to concede to the USA essentially everything the latter had ever demanded it concede and had given the USA material support in the invasion of Afghanistan); yet their offer had been categorically rejected., the Islamic leadership concluded that there were then no further concessions it could possibly offer to make Washington happy. So, the leadership in Tehran concluded it needed more bargaining power. It needed to develop an additional lever that could subsequently be sacrificed (as with a chess gambit) in negotiations with the USA. Something sufficiently threatening to exchange for security guarantees against regime change. Hence, their nuclear program was ratcheted up, accompanied by bellicose threats (including against Israel) to maximize its impact. So, the point that struck me when I heard that Abu Ghraith had been released by the Iranians in the run-up to the recent nuclear negotiations in February was that this might very well be a token of good faith the Iranians had given to Washington, just as they had previously offered to do to make a Grand Bargain in 2003. In fact, the subsequent February nuclear negotiations went relatively well (which is unusual in recent years), according to statements made by each side in their immediate aftermath. I should add that, for its part, the Obama administration has gone very far to demonstrate it really does prefer a negotiated solution. This is a very significant shift in U.S. policy from the aforementioned Bush neo-con-dominated years. What makes the Obama administration’s seriousness about negotiations particularly believable is that it has invested the great majority of its diplomatic capital since 2008 in achieving an unprecedented international sanctions coalition. Most pundits then believed that bringing on board Russia, China and Germany was not a realistic possibility. In addition, Obama et al have done what was needed to restrain counterproductive bluster by Israel’s Benjamin Netanyahu. As soon Obama came to office, his administration tried seriously to negotiate. However, when that proved to be a waste of effort, and the process collapsed during Tehran’s suppression of opposition protests following the fraudulent Ahmadinejad re-election, the administration cut off any further negotiations and turned up the sanctions regime. This clearly signaled to Tehran that, if Tehran was not serious about and/or not in a position to negotiate, then the administration was not going to waste time in empty talk. While the unprecedentedly severe oil-and-financial sanctions regime coalition was built up, at significant diplomatic expense, the administration continued to refuse to negotiate with the Islamic Republic. Now that is has returned to the table, it returns with more credibility that the Obama administration really would prefer to negotiate a settlement than engage in an armed conflict. So, Tehran is under severe pressure from the new oil-and-financial sanctions regime and, by all indications, the US and the P5+1 are interested in serious negotiations. But, has in fact Tehran gotten the message? If it wanted to show its is also inclined to engage in some serious horse trading, how might they signal this to Washington after so many detours on its part? Making a “gift” to Washington of the man who stood beside Bin Laden when he gloated to the world about his successful attacks on 9/11 might make an impression on Washington. However, this is speculation. What is, however, clear is that if Iran does not negotiate seriously, it will be very difficult for Obama et al, after expending such diplomatic capital to achieve the present sanctions regime, to turn back from “the continuation of politics by other, i.e., violent means” as Clauswitz put it. In the end, U.S. interests in restricting Iranian projection of power in the Gulf are at the foundation of its role as protector of the security of “the Global Barrel”–the global oil market. This role is one of the pillars of U.S. global power, and one from which Obama, as Bush before him, will never let go. Presently, U.S. energy and geostrategic interests on the global stage are in collision with Iranian regional interests of power projection and achieving its natural place as a powerhouse producer in the oil and gas sector. Clearly, the best resolution, for regional and world peace, would certainly be a negotiated settlement. ASIDE #2: Perhaps Mr. David Sanger at the NYT, Mr. Bob Woodward, who still at times writes for the Washington Post, or others with their degree of access to confidential sources in DC, could press for some indication of the meaning of Abu Ghaith’s falling into U.S. custody. This entry was posted in Germany, international relations, Iran nuclear, Persian Gulf, Resource conflicts, Sanctions, The USA and tagged 9/11, Abu Ghaith, Al Qaeda, Bin Laden, Iran, John Kerry, Jordan, Sulaiman Abu Ghaith, Turkey, United States. Bookmark the permalink. Interesting! Wonder if Bush’s shortsightedness partially is to thank for today’s ~ $10 risk premium in Brent crude oil and thus $4+/gallon gas prices?